New York (TADIAS) — PM Abiy Ahmed visited the United States in July 2018 meeting with members of the Ethiopian Diaspora community in Washington D.C., Los Angeles and Minneapolis. During his successful three city tour PM Abiy also met with religious leaders and took part in the peace and reconciliation conference in DC between the exiled synod of the Ethiopian Orthodox Tewahedo Church and the synod in Ethiopia. The churches were reunited after almost three decades of separation. In Washington, DC PM Abiy’s busy schedule included a meeting with Vice President Mike Pence at the White House on Friday, July 27th. In addition he met with International Monetary Fund Managing Director Christine Lagarde. The Mayor of Washington, DC Muriel Bowser proclaimed July 28th, 2018 as “Ethiopia Day in DC” in celebration of PM Abiy Ahmed’s visit to the U.S. capital, which is a sister city of Ethiopia’s capital city Addis Ababa. “Now, during this new climate of goodwill and unity, we look forward to reaffirming the Sister City relationship between our two capital cities,” Mayor Bowser said. 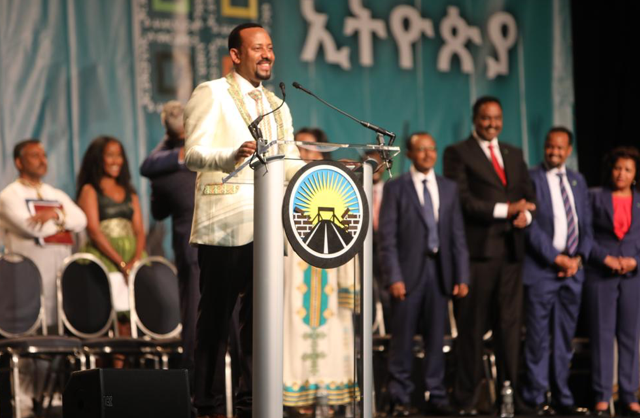 Likewise in Los Angeles an “Ethiopia Day” proclamation was presented on behalf of the L.A. City Council on July 29th at Galen Center on the campus of the University of Southern California (USC) where a cheerful crowed of thousands welcomed the Ethiopian prime minister to California. And in Minnesota as the TwinCities.com website notes over 10,000 gave PM Abiy Ahmed “a rock-star greeting” at Target Center in Minneapolis on July 30th.